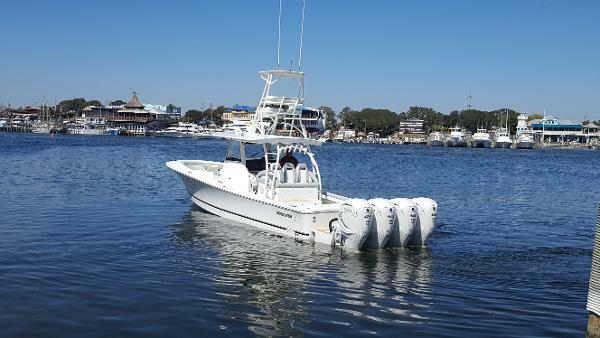 2019 Regulator 41 Yacht Center Console Quad White Yamaha XF425 XTO Outboards In Stock in Destin, Florida OPTIONS Quad Yamaha 425's Garmin Offshore 41 Package - Triple 17" GPSMAP 8617 MFD's VHF 210 Radio w/ 8' Digital Antenna GMR Fantom 54 Open Array Radar Airmar B275LHW 1 kW CHIRP Transducer Autopilot Factory Installed Garmin GXM 53 Sirium XM Weather Marine Receiver Upgrade White Hull Color White Powder Coat Package Dual Station Tower w/ Controls and Hardtop Dove Gray Upholstery 4X Deluxe Tackle Center w/ Mezzanine Seating, Grill, Sink, Drawers, and Tackle Storage Cockpit Freshwater Engine Flush Multi-colored Underwater LED Lights Remote Controlled LED Spotlight Sureshade Rear Sun Shade STANDARDS Yamaha CL7 Touchscreen (Console & Tower) Battery System w/ Switches and 8 Marine Bateries Wraparound Windshield Edson Polished Silver Wheel Helm A/C Vents Sleeping Accommodations for 2 Galley w/ Refrigerator, Microwave, Sink, Cooktop, and Storage A/C 8kW Fischer Panda Disel Generator Electric Head Hot Water Shower SeaKeeper 6 Gyro Stabilizer And so much more... 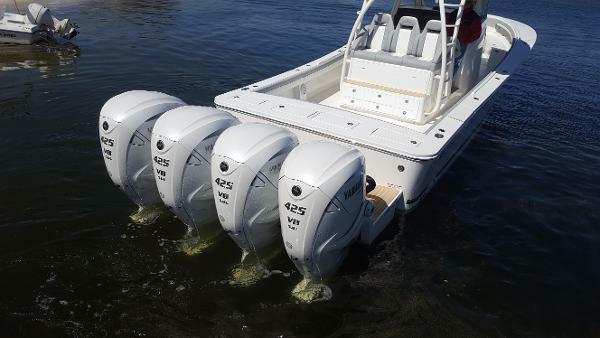 Experience the all-new Regulator 41, updated with features to meet your every offshore need. 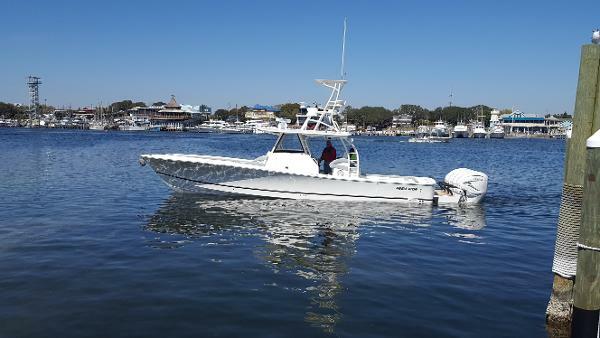 The new integrated wraparound windshield offers more protection at the helm, while the aft mezzanine seat with prep & tackle center and overhead SureShade provide additional cockpit seating without compromising fishing amenities. Redesigned tower access makes the dual helm even more attractive, and, below deck, an expanded cabin features galley kitchen, double berth, and spacious head with shower, allowing you to accommodate friends and family with ease. Serious anglers will love the optional Taco Grand Slam 380XL outrigger bases with 20’ Carbon Fiber telescoping poles and huge livewell and fishbox capacity. Powered by Yamaha’s all-new quad XF425 engines, with the added stability of the Seakeeper 6 stabilization system, the 41 is everything you’ve ever wanted in a luxury sportfisher. Financing Available. Pricing if displayed may or may not include boat, motor(s), trailer, options, freight, and prep. Please call us for complete pricing. This vessel is offered subject to prior sale, price change, or withdrawal without notice. Seller Gregg Orr Marine, Inc.